Right angle weave is a versatile stitch that can be used to make simple flat bead chains with seed beads, used as a base stitch for embellishment or used with crystals, round glass or gemstone beads. There are two versions of flat right-angle weave, usually referred to as RAW, single needle RAW and 2 needle RAW. This tutorial will show you the basics of two needle flat right angle weave. Prepare a length of beading thread and add a needle to each end of the thread. You will begin the beadwork in the center of the thread and work towards the ends. You can use whatever type of beading thread you prefer, but FireLine or Nymo are always good choices. Rounded edge beads, such as Miyuki size 8 or size 11 round seed beads, round glass or gemstone beads or bicone crystal beads are all good choices to use with ​right-angle weave. To get started with 2 needle RAW, pick up four beads and slide them to the center of your thread. Some people recommend picking up 2 beads with 1 needle, 1 bead with the second needle, then stringing one more to get used to the pattern you will eventually be using. That seems unnecessarily complex–just know that you only pick up 4 beads for the first stitch. Using your second needle, put the needle back through the last bead you picked up. Your thread will be coming out of opposite sides of the bead. Pull your thread taut and adjust the beads to make sure you are still starting in the middle of the thread. The resulting shape should look like a cube or square. Depending on the beads you use, they may or may not align at sharp right angles, but they will typically fall into shape as you add more beads. To make the next stitch, pick up two beads with one needle and one bead with the second needle. Which needle you use for which does not matter much at this point. However, when you start the next rows, it will matter. Put the needle that you picked up one bead with back through the last bead of the two strung using the other needle. Once again, it is going in the opposite direction as the first thread. Pull thread taut to make the beads align in right angles. Continue the same pattern of picking up two beads with one needle, one bead with the other and stitching back through the second bead until you are up to the last stitch on the row. The last stitch on the row is slightly different because you need to turn the corner and move your needles to be positioned to start another row. For the last stitch on the row, pick up two beads with one needle, one bead with the other–like the previous stitches, but this time you will use the needle that you used to pick up two beads to stitch back through the single bead picked up by the other needle. When you pull the thread taut, you will notice that your thread is now coming out of the bottom of the bead grouping (or top if your single bead was on the top), not from the bead on the side of the work. To make the next stitch, pick up two beads with the needle attached to the thread pointing away from the beadwork. Pick up one bead with the needle that is facing towards the inside of the beadwork. Stitch back through the single bead. When you pull the beads taut, your needle will be positioned much the same way it was when you were making the first row. The difference is that there are beads from the first row of beadwork that need to be incorporated into each stitch. From here on, the stitches in the row will only need to pick up two new beads per stitch. With the needle attached to the outside thread, pick up two more beads. With the needle attached to the thread facing in towards the beadwork, stitch through the next bead from the prior row. This is equivalent to picking up a single bead in the first row of beadwork. Now you are in a position to complete the right angle weave stitch. Go back through the last bead picked up on the other needle and pull taut. Remember that your beads may not always align in neat right angles. Typically, the rows and beads will straighten out as you stitch more rows. Don't pull your tension too tight to compensate or your beadwork will not lay flat. Make sure you are always stitching back through the last bead. You can tell when you have stitched back through the bead because your threads will be coming out of the bead in opposite directions. When you go through the bead, your needles and thread will both be coming out of the bead in the same direction. For the rest of the row, until you need to make the turn, continue the stitch by picking up two beads on the 'outside' needle, and stitch through the one bead on the prior row using the inside needle. Then, use the inside needle to stitch back through the last bead from the outside needle. For the turn, pick up one bead with the outside needle, stitch through the one bead on the prior row with the inside needle and pick up a single bead. Then stitch back through the bead on the other needle. This will position your thread to start the next row. Designs for right-angle weave can be done with either a double needle or single needle, depending on what is easier for you. Some people find the alternating circles of flat single needle RAW confusing, but it is actually the same pattern as flat single needle ladder stitch. Once you have learned the basic of right angle weave, there are many variations that can help you create amazing jewelry. Flat single needle right angle weave makes easy chains for pendants or as a base for embellishing. You can also increase the size of the chain by using 2 beads in every stitch instead of one. You can create unique results by trying different sizes and shaped beads. 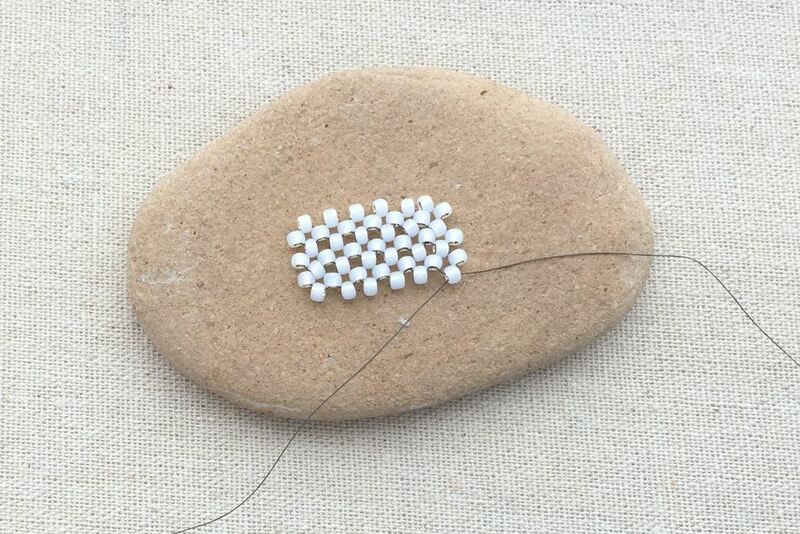 Right angle weave works great with seed beads, but it is also a great stitch to use with larger round beads or crystals. The example in this picture is a crystal bead tennis bracelet design made using single thread right angle weave, bicone Swarovski crystal beads and size 11 Japanese cylinder beads. Variations of the right angle weave include tubular right-angle weave, which makes a beaded rope or tube of beadwork similar to tubular netting stitch or tubular peyote stitch.